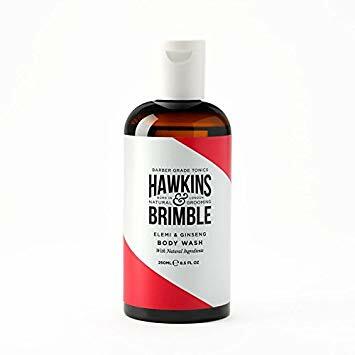 The Hawkins & Brimble Body Wash has the unmistakable red and white barber pole style branding that is seen through the Hawkins & Brimble brand. The body wash comes in a 250ml plastic bottle with a flip open lid and you just gently squeeze to dispense the wash.
What I liked about the body wash is that it is oily and gives a refreshing sensation as you use it, I have sensitive skin and many products can cause a reaction but that was not the case with the Hawkins & Brimble body wash. The scent is Elemi and Ginseng, we all know the earthy and woody Ginseng but Elimi might be one you haven’t heard of? It is in fact an ancient resin that was used way back by the Egyptians in their embalming process, it is a resin from the Canarium Commune tree in the Philippines and is similar in scent to Frankincense, some describe it as peppery with citrus. Now whilst this scent was very nice whilst using it, as soon as your rinse it is gone which is a shame, but then I guess a good rinse is liable to do that? The Hawkins & Brimble body wash contains Aqua (Water), Cocamidopropyl Betaine, Sodium Lauryl Sulfoacetate, Phenoxyethanol, Sodium Benzoate, Sorbitan Sesquicaprylate, Glyceryl Laurate, Sodium Chloride, Sodium Sulfate, Parfum (Fragrance), Citric Acid, Aloe Barbadensis Leaf Juice, Sodium Phytate, Linalool, Potassium Sorbate. I did like using the wash and priced at £8.95 for the 250ml on the Hawkins & Brimble website it isn’t going to break the bank and if you buy the wash on subscription you get 15% off the first purchase and 5% off of each order after that.